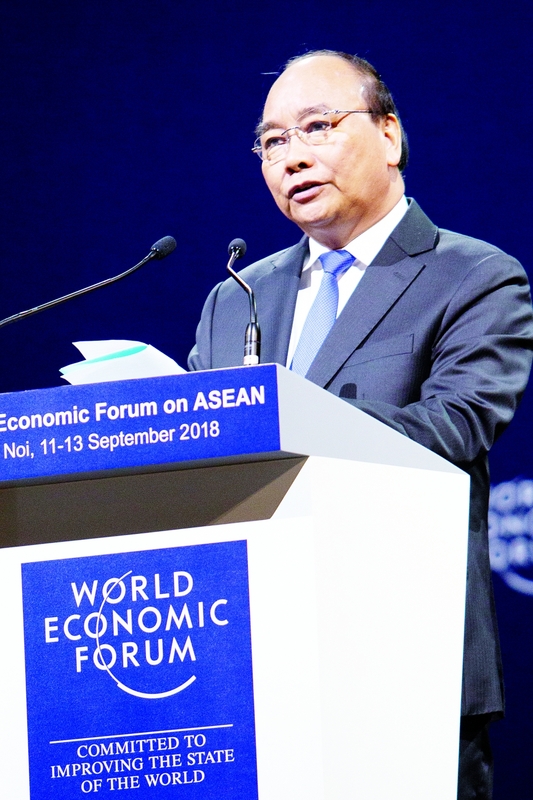 As the host of WEF ASEAN 2018, Vietnam focused discussions on ideas and major directions for ASEAN’s development in the fourth industrial revolution, contributing to implementing the ASEAN Vision 2025. Collectively, the 10 countries that make up ASEAN - Brunei Darussalam, Cambodia, Indonesia, Lao People’s Democratic Republic (Laos), Malaysia, Myanmar, the Philippines, Singapore, Thailand and Vietnam - form the world’s fifth biggest economy. Klaus Schwab, Founder and Executive Chairman of the World Economic Forum, said WEF ASEAN 2018 was the most successful regional meeting in 27 years. “Alongside rising geopolitical uncertainty, ASEAN countries must grapple with the disruptions of the fourth industrial revolution,” explain Justin Woods, leading the meeting for the World Economic Forum, and Borge Brende, President of the Forum. “The exponential development of new technologies such as AI, advanced robotics, precision medicine, autonomous vehicles and many others are not just changing, but are transforming economies, businesses, societies and politics.” At meetings and discussions, a wide range of initiatives and solutions were proposed to meet these challenges and take advantage of the fourth industrial revolution. ASEAN countries have realized the need to capitalize on their strengths and create momentum for innovation and growth amid rapid global changes. 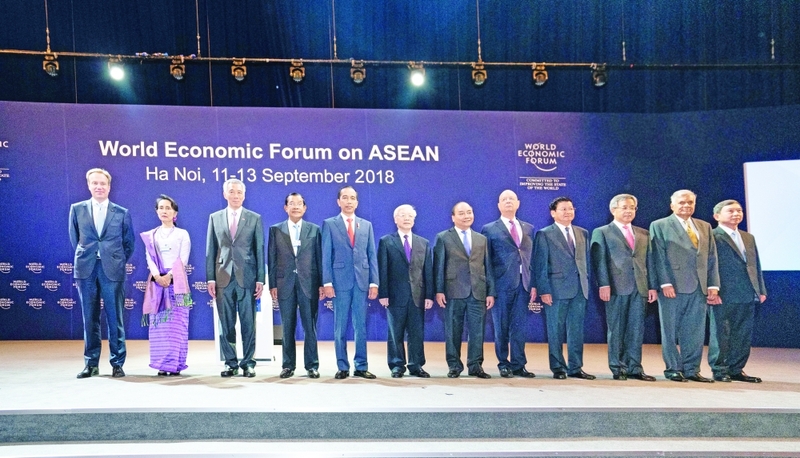 Vietnamese Prime Minister Nguyen Xuan Phuc told participants that with a combined population of over 640 million accounting for 8.5 percent of the global population, ASEAN is now the third biggest economy in Asia and the fifth in the world. ASEAN should promote the intra-regional market, which is sufficiently large for development strategies, he added. Within the framework of WEF ASEAN 2018, the Vietnam Chamber of Commerce and Industry (VCCI) coordinated with other relevant ministries to chair the Vietnam Business Summit 2018, a Vietnamese initiative designed to introduce the potential domestic market to foreign investors. The summit attracted about 1,300 business representatives, and focused on conveying the message that Vietnam is a serious and reliable potential partner that treasures connectivity and creativity. Vietnam aims to move to a higher position in the global value chains and enhance the connectivity between Vietnamese and FDI businesses. Vietnam has long treasured the substantial benefits of free trade, particularly amidst the formidable challenges posed by global trade protectionism currently threatening bilateral and multilateral trade deals, PM Phuc said. “Vietnam has no ambitions to be the best in globalization but it has a desire to befriend the best players,” said PM Phuc. Vietnam has to make more efforts, especially to create more powerful innovation in order to raise the level of economic development and narrow the gap with other countries in the region. PM Phuc also reaffirmed the Vietnamese government’s efforts in promoting institutional reform, enhancing competitiveness, facilitating the business environment and creating favorable conditions for foreign investors to invest in Vietnam. Vietnam’s reform and development agenda is linked to global value chains, business opportunities with Vietnam in the digital era, especially the bright innovation projects. Financial investment opportunities involved in the restructuring of state-owned enterprises, private sector development, and socioeconomic infrastructure development projects are expected to boom in Vietnam in the coming time.